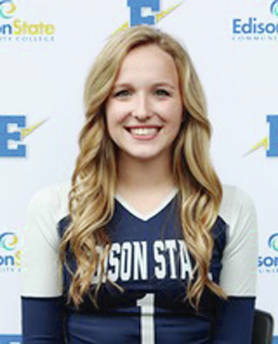 TOLEDO — The Edison State Community College volleyball team is off to an 8-0 start and sophomore Noel Ufferman was recently honored as OCCAC Player of the Week. Ufferman stuffed the stat sheet with 8.32 assists, 3.83 digs, 1.50 blocks and 1.67 kills per set while attacking .405 during Edison’s first three matches. The Chargers dropped a lone set in the three victories, including a 3-0 road sweep versus conference foe Lorain County. Ufferman registered no less than 27 assists, 11 digs and four blocks in all three contests. Edison is coming off four wins in the Owens tournament over the weekend. The Chargers opened with a 25-22, 21-25, 25-23, 25-14 win over Kellogg. Reagan Morrett had 18 kills and 11 digs, while Miranda Hickey had 11 kills, 14 digs and eight blocks. Ufferman had three aces, 14 digs and nine blocks; Navie Garber and Aimee Powell had six blocks each and Cali Stewart added four blocks. Whitney Pleiman had two aces and 40 digs, while Vanessa Winner added 21 digs. Edison followed that with a 25-15, 25-7, 25-20 win over Henry Ford. Hickey had 17 kills, 12 digs and four blocks; while Morrett added 10 kills. Garber added three blocks, while Ufferman dished out 24 assists. Camille Odle had two aces and 10 digs, while Pleiman led the defense with 15 digs. Edison defeated Mott College 25-20, 25-16, 20-25, 25-23. Winner had 11 kills, 12 digs and five blocks, while Morrett had 10 kills and six blocks. Hickey had eight kills and 11 blocks; while Garber had nine blocks and Powell added seven. Ufferman dished out 34 assists and added two aces and 15 digs, while Odle served three aces and had 13 digs. Pleiman led the defense with 34 digs and Kelsey Peters added 15. Edison capped the tournament with a 25-21, 25-14, 25-19 win over Jackson. Winner had 10 kills and 13 digs; while Hickey added nine kills and seven blocks. Morrett and Powell had 10 blocks each, while Garber added five blocks. Ufferman dished out 29 assists and had 13 digs, while Pleiman and Odle led the defense with 13 digs each. Edison will play at Clark State Saturday.